Did you ever wonder what it would be like to work construction? More importantly, did you ever want to drive one of those really big Caterpillar trucks? Now you can live out your fantasies with MATCHBOX CATERPILLAR CONTRUCTION ZONE. You will get to drive 11 different Caterpillar trucks including Track Type Tractor, Integrated Toolcarrier, Articulated Truck, Challenger Agricultural Tractor, Lexicon Combine, Log Skidder, Wheel Loader, Paver and Backhoe Loader. 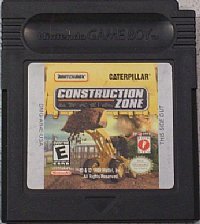 In each level, you are given a construction task to complete, such as building a pool or repairing a road. Luckily, George, the construction foreman gives you guidance. If you listen to him, you should be able to build everything in MATCHBOX CATERPILLAR CONSTRUCTION ZONE.